Revenge will be in the air when Boroughmuir make the trip across Colinton Road for tomorrow’s Tennent’s Premiership clash with Watsonians at Myreside (3pm). However, while making amends for the 23-14 loss in September will be an incentive, the main driver for the visitors will be the chance to move closer to the play-off spots, a target that has become a realistic objective following three successive bonus point wins. Even in defeat at Melrose last week, Sonians showed enough to suggest that this is a side worthy of its top four ambitions. Coach Steve Lawrie, who has been forced to draw on the depth of his squad with several regulars unavailable, knows that a win could be enough to move into the leading quartet. 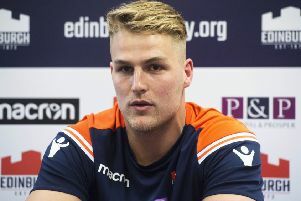 Across the Capital, Edinburgh Accies have international prop Murray McCallum making his debut for the club in an all change front row that also features Rory Simpson and Duncan Morrison for the visit of Melrose (2pm). Cairns has four professionals released this week, with Greg Peterson, Tevita Tameilau and Charlie Shiel all starting, while Kiran MacDonald is on the bench. Elsewhere, third-placed Heriot’s travel to face leaders Ayr.